Who will succeed? Philippe Coutinho perhaps? 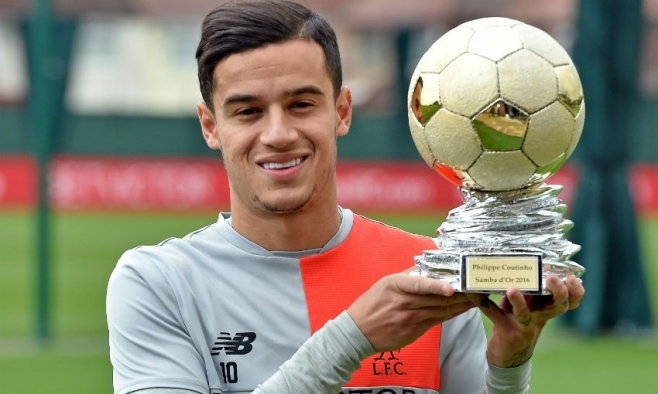 For the past ten years, the site sambafoot.com has offered its readers to vote for the best Brazilian player of the year. Great players like Kaka, Thiago Silva, Neymar have been able to lift the Samba Gold Trophy, an individual award voted for by football fans, journalists and former players. Double winner while he played at Barça, Neymar will covet this trophy after an excellent start to the season with Paris Saint-Germain. Last year, Philippe Coutinho’s star had risen having forced his way into the Seleção starting line-up. But Neymar is not the only one with remarkable achievements in 2017. We can mention the two players of Real Madrid, Marcelo, who reached his peak with a remarkable double with the La Liga and the Champions League titles and his teammate Casemiro, now indisputable first choice in his team and one of the best in his position in the world. With the arrival of Neymar at PSG, Daniel Alves and Marquinhos have also dominated this season in Ligue 1 and the Champions League, not to mention the meteoric rise of Gabriel Jesus, who has had a brilliant year with the Manchester City of Guardiola. It's now up to you to choose by voting for your three favourite players.